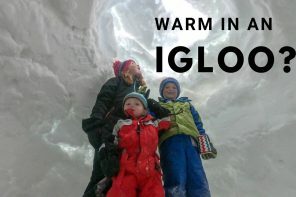 Finding a good ski resort that has both the terrain and the culture that you want is a special thing. It becomes part of you and after a while it begins to feel like a second home. That’s how we feel about Solitude Resort. It’s a place where we feel comfortable, have fun and all know our way around. With the IKON Pass skiing Solitude is even easier than it was before, since you get days at resorts all over the country. To help you make the most of your time there, we’ve created this guide to help you hit the slopes hard with with the info you’ll need for the day. Now before I go on telling you the ins and outs of everything at Solitude, I need to tell you what we love the most about skiing here. There are two different base areas at Solitude. The lower lot is the Moonbeam base area and the upper lot is the Village area. If you’re just coming up for the day, park at Moonbeam – it’s got quicker lift access and the lot is MUCH BIGGER. If you’re staying overnight, head to the Village. Also, make sure to get in the canyon EARLY especially on weekends or right after a big storm. The parking lot isn’t huge and if it’s full you have to park down the road. On busy times (weekends/powder days) be in the canyon by 8, or on slower times 8:15 or 8:30 is usually fine. It’s hard to find a parking spot between 9:30-11, but after that people start leaving and it’s not too hard to grab a spot for the afternoon (that’s what we often do). This varies greatly depending on your skill level and that’s one of the best things about skiing here. There are good beginner hills and places to take the kids and you get everything all the way up to the SUPER STEEP (which we absolutely LOVE for a quick run sans kids). 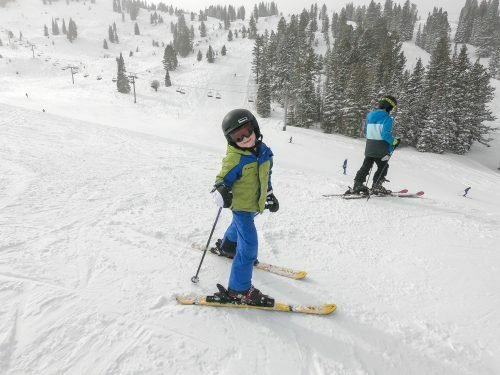 Our level 2 skier, little Ethan likes to stick to the Link lift. He’s still working on his turns and stopping so until he gets those mastered, we’re staying here (unless he’s getting some serious help from Dad on another trail). 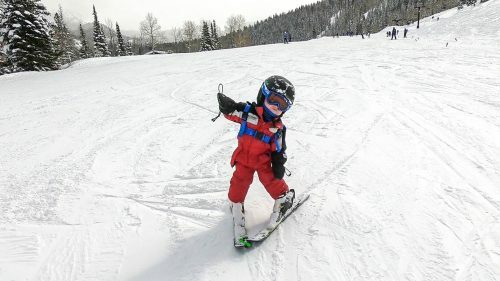 Our level 3 skier, 4-year-old Connor, says, “My favorite place to ski is in the trees and on the jumps when I go on Moonbeam. 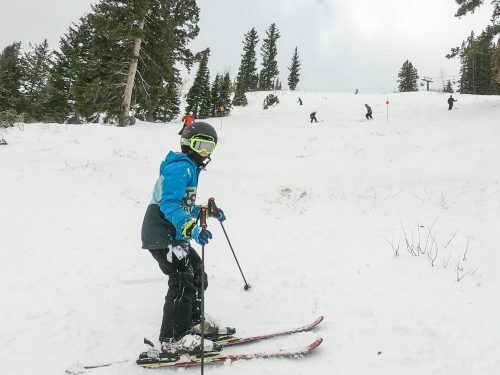 I ski really good when I go on jumps.” Yes, for kids, the little trails through the trees you’ll find all over the runs on the Moonbeam Express chairlift will have them wanting to go over and over again. Once you’ve gotten the hang of this route a couple of times, it’s time to venture out into the other green trails accessed by Moonbeam. 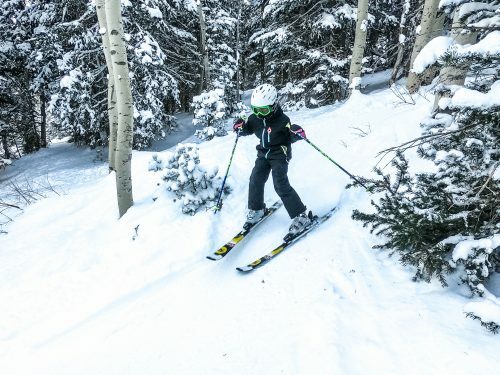 If you’re up for some adventure, head into the trees (just remind your kids to ski slowly in the trees). The easiest tree section is right at the bottom of the first hill on Same Street, between the Same Street and Tude-Dudes runs. 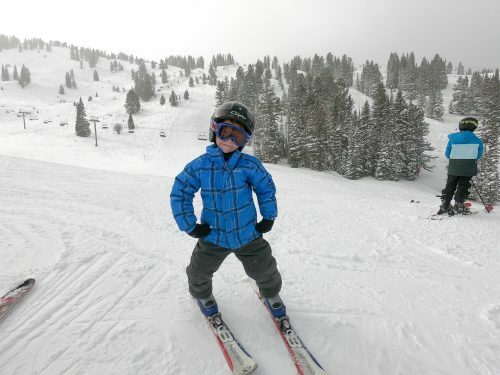 Level 6: Our level 6 skier, 9-year-old Cameron, says, “My favorite place to ski a lot is on the Eagle lift. 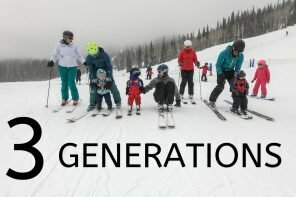 I like it because there are lots of blacks that I can ski on while my siblings are skiing on blues close by, so I get a chance to ski on more runs that are hard there.” Because we have kids of so many different abilities, it’s great to be able to give our more advanced kids a bit of freedom while still having them close by. 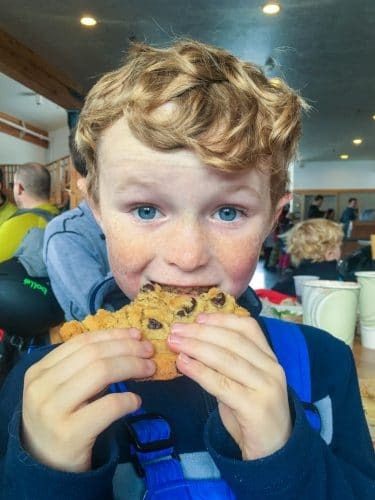 Often we ski on the Eagle Express chairlift and can have kids that are on several different runs, all within our line of sight (or within shouting distance) — which makes it a great place to suit all their needs! 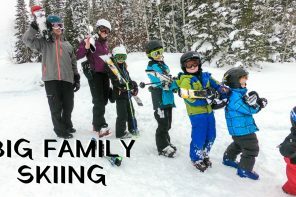 Jessica and Andrew (Mom a& Dad) Level 9: We spend a good chunk of our days on the beginner slopes with the kids. So, when it’s time to get out on our own, we hit the slopes HARD! All over the mountain, you’ll hear everyone talk about how great Honeycomb Canyon is. It does a great job at keeping stashes of powder for a long time, but it’s tricky to access and takes 3 lifts to get back up to. To maximize our time on the slopes, we usually opt for laps on the Summit lift. Headwall forest is our happy place as one of the steepest parts of the mountain, and both of us would be thrilled skiing this section ALL DAY LONG! When we have a little more time, we hit Honeycomb, but Summit is our FAVE! You can find more details on specific runs in this article we wrote. I’ll be honest, paying resort prices for a meal always makes me a bit crazy. With our big family, we can easily spend $100 on just one meal. So if we’re going to paying that sort of money, it better be GOOD! So in the name of research, we tested the best family dining options available at Solitude for you. 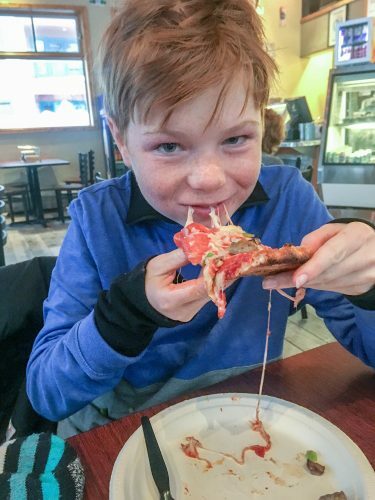 Cheapest: If you’re looking for a cheap option that will keep everyone happy, head to Stone Haus Pizza. It technically isn’t considered on mountain dining, since it’s in the village, but it’s only about 50 steps away from the slopes, so don’t let that deter you. There you can get a large pizza for around $20 and for $5 you can get a 16oz bowl of soup and chips. Our Favorite: Last Chance Southwest grill is always the winner for us. The burritos are HUGE (think Chipotle sized) and we absolutely love the way they taste. 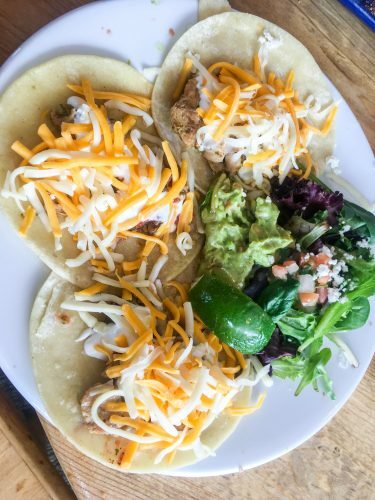 Our little ones love the tacos and we love that three come in an order so that they can each have their own. The Fallback: Moonbeam lodge is the obvious choice for food since it’s right at the main base area, but honestly, we avoid eating there. It’s the most crowded at lunch and honestly, we like the food better at other places on the mountain. For us, it’s an excellent place to grab cocoa and fries to warm up on a cold day (especially with their amazing fireplace), but for lunch, we’d recommend going elsewhere. BROWN BAG AREA: Truth be told, we rarely eat on the mountain, and are big fans of the brown bag area. 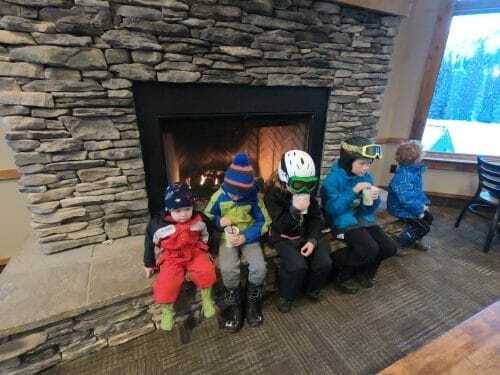 To call it a lodge would be a stretch, but there is an area in the basement of the snowsports school (access if from the parking lot) that has tables and vending machines. It’s the perfect place to bust out your PB&J or your thermos full of chili. With most ski resorts getting rid of these type of areas, we’re THRILLED that Solitude has a place to eat your own food! If you want more info on dining options check out our other article here. 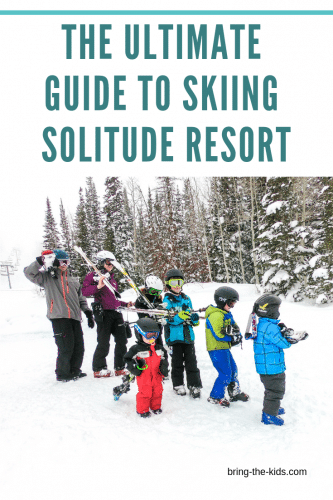 There are 4 ski resorts right out of Salt Lake City in the Cottonwood Canyons, yet Solitude is the only one with a real base village. In the village, you’ll find 7 different lodging options ranging from a hotel room up to private homes available to rent. You’ll find no shortage of things to do with the game rooms, pool and the spa to keep you occupied when you’re not on the slopes. Find all the details about where to stay at the resort HERE. If you choose to stay down in the valley, there are plenty of hotels within 20 minutes of Solitude (zoom in or out on the map below to find hotel options near Big Cottonwood Canyon). 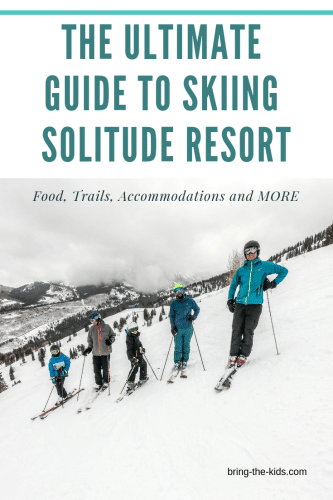 So whether you’re a day visitor to Solitude with the IKON Pass or you’re like us and wanting a great place to ski for an entire season, Solitude is a fantastic option! 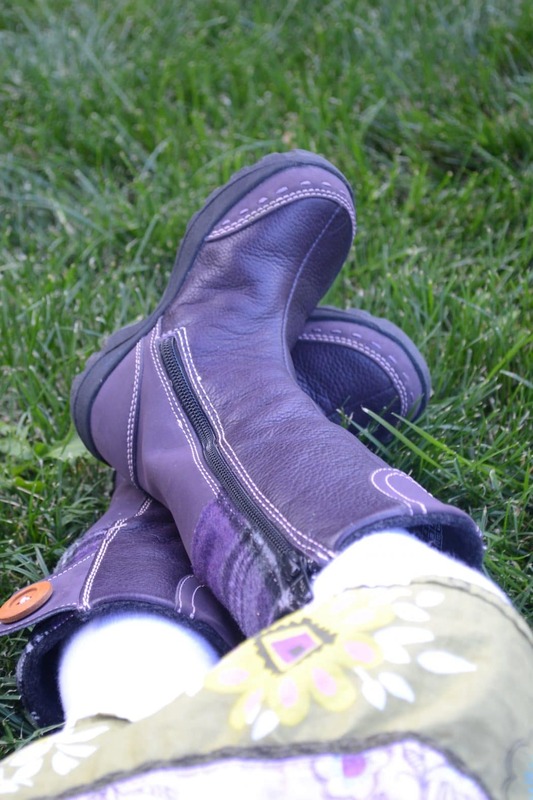 How To Organize your Ski Gear for Stress Free Packing!